One of the best parts about getting fit is that so many workouts, such as taking the stairs or walking to work, are also eco-friendly. With fitness trackers, you can accurately monitor your activity and work toward specific goals. 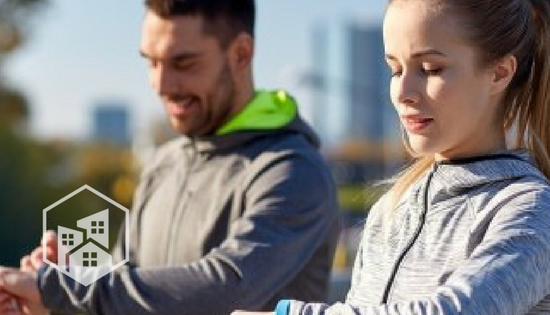 As fitness trackers have become more and more popular, there are more brands and models than ever before. We took a look at popular models to help you decide which one will get you to your fitness goals while still staying green. If you’re not used to exercising, check out the UP MOVE by Jawbone. This tracker has all of the basic features you need, without being overwhelming or intimidating. You can clip the tracker onto your clothes or wear it on your wrist to track your steps and calories burned. Once you set up the app on your smartphone, you can also log your food intake. The UP MOVE has sleep-tracking capabilities and syncs data wirelessly to your phone. The battery charge lasts up to six months, giving it a huge advantage over its competitors. At $49.99, it’s an affordable tracker that will still get you motivated to start your fitness journey. The Fitbit Charge HR tracks your steps, calories, stairs climbed and your heart rate all day. The Fitbit app is encouraging and celebrates when you hit new milestones and goals. If you add friends on Fitbit, you can cheer for each other and make daily, weekend or workweek competitions. When your Bluetooth is turned on, your Fitbit Charge HR will vibrate if you’re getting a phone call. Wear your Fitbit Charge HR at night to track your sleep cycle and set a goal to get your eight hours each night. On average, the battery lasts up to five days. At $149.95, this is the perfect fitness tracker if you’re ready to take your workouts to the next level. The Microsoft Band 2 is a hybrid between a smart watch and a fitness tracker. It has email, text and calendar capabilities similar to a smart watch. The Microsoft Band 2 also has a continuous heart rate monitor, so it accurately tracks your activities and workouts. Even though it’s a Microsoft product, this tracker is compatible with iPhones, Androids and Windows phones. Unlike the UP MOVE or Charge HR, this tracker has additional GPS capabilities to track the routes for your runs and bike rides. At $249.99, it’s more of an investment than the others, but it can save you from constantly checking your smartphone. When it comes to multisport training, the Garmin Vivoactive sets the standard. This wearable fitness tracker uses GPS to track running, cycling, swimming and even golfing. The running app tracks your distance and pace, and you can set up vibrations for heart rate, pacing or interval goals. The golf course database has information for 38,000 courses worldwide. Unlike most trackers, the Vivoactive is waterproof, so you can swim, sweat and shower while wearing it. The battery charge lasts for up to 3 weeks of activities, or 10 hours of GPS tracking. If you’re training for a triathlon, this tracker is worth the price of $219.99. The Apple Watch Sport is more than just a fitness tracker. With this device, you can check your email, reply to text messages, answer phone calls, get directions, listen to music and ask Siri for anything else you might need. Of course, it also tracks your daily activity, speed, calories burned and heart rate during your workout. The battery lasts up to 18 hours, depending on usage. The Apple Watch Sport starts at $349. While it’s cheaper than the Apple Watch, which starts at $549, it’s still expensive if you’re only looking for a fitness tracker. The Apple Watch Sport works the best for those who love Apple products, are serious about fitness and can’t go five minutes without looking at their iPhone.